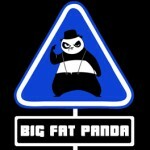 Announcement: Here we are – Big Fat Panda on the web! Bookmark this site today, like us on Facebook and come back and visit us often! A wee while ago we set about getting an official channel set up on YouTube. Well it’s finally happened although we don’t have a lot of our own official videos on there yet. Anyway, we’ve started a Big Fat Panda Live play list and we are actively adding any videos we find on YoTube where we are caught in the act of playing live. We would like to wish our drummer Hutch the very best of British for Tuesday . He is away for an audition for Stomp down in London.